Thirteenth Edition, Northampton, Mass. Published by J. H. Butler, 1849. The owner/user of this copy appears to have been one George Edin Moore, with some late entries possibly in a second and even third hand. My evidence is a series of seven resolutions written in the volume immediately following pages ZuuZ, signed by George Moore and concluding: Done in Delaware, Ohio. Sunday Oct 24th, 1852, in the S. W. room 2d story, in Prof. Merrick (where the passage cuts off). A George Edin Moore is listed in the Catalogue of the Ohio Wesleyan University for the Academical Year 1860-61 (Delaware, Ohio) here. The president of that institution was Rev Frederick Merrick, Professor of Belles-Lettres. I have copied and confirmed this transcriptions against Hawthorne’s text, and may add them here, later. 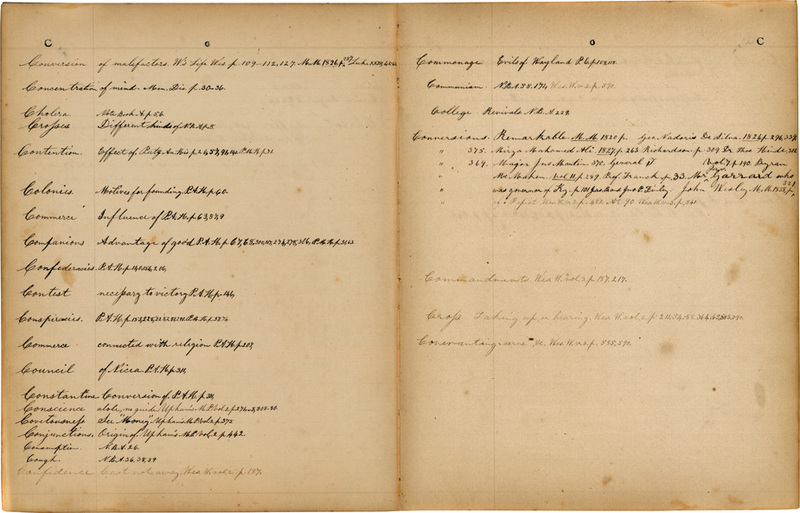 two pages, set up in tabular form, with entries under the heading Noted Orphan Houses. Several items are laid loose in the volume: a pin (or nail), 1 1/8 inches long, at EooE; a flower at FuuF; a flower at HuuH; a newspaper clipping (cure for dyspepsia, and a joke at the expense of an Irishman) at IaaI; a irregularly cut stiff sheet with a penciled passage from Wordsworth ( A flock of sheep that leisurely ) on one side, and the penciled note 5 swarms / 8 hives / $30 on the other, at LuuL; and a flower at TaaT. I will endeavor to identify the flowers. Upham taught at Bowdoin, where Nathaniel Hawthorne was one of his students. John Wesley. The Works of the Reverend John Wesley (the seven volume American edition of 1840). Most frequently cited are volumes 3 and 4. I have confirmed the preceding sources by checking citations (extract or topic, and page number if available) with copies available on Google Book or Internet Archive. N.B.A., also Note Book A — possibly his own (college) notebook? 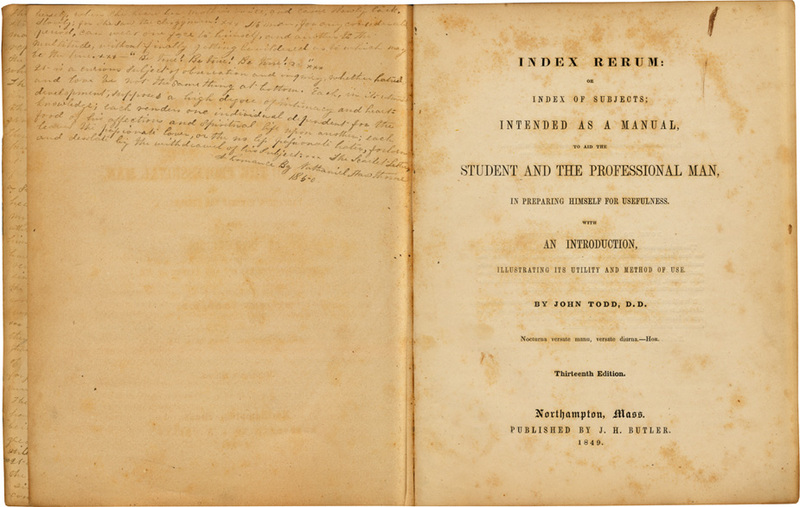 Indexing scholar/historian/practitioner Hazel K. Bell (aka KayCliff) makes a few general observations on nineteenth century indexing practice, in her LibraryThing review of George Gissing (1857-1903) his The Private Papers of Henry Ryecroft (1903). (See that review here.) Among her comments is this: in his index to that novel, Gissing gives only a single page number to an entry, where a topic might be treated in subsequent pages. Moore provides a different picture of indexing practice by giving long strings of page numbers to many of his entries; moreover, he concludes those strings with a comma, leaving room for additions as they are encountered in his reading. I have not yet identified Moore, apart from the Ohio Wesleyan University connection. 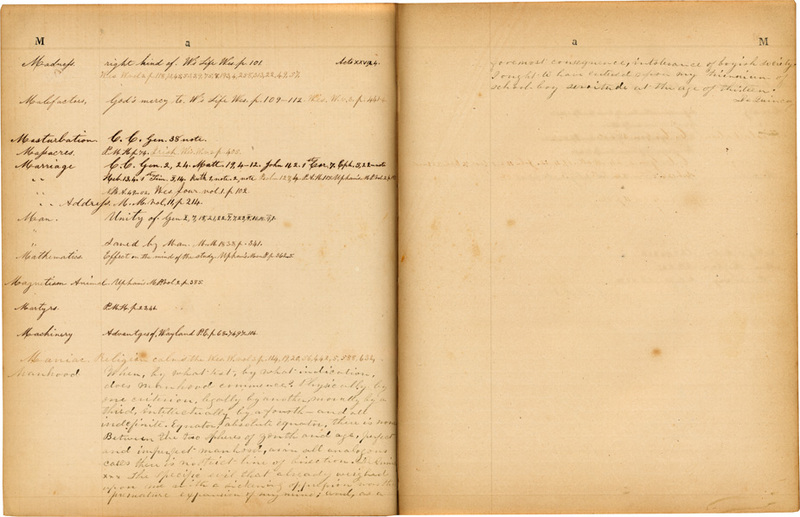 Cholera Note Book A. p. 5, 6. Contention Effect of. Pütz An. His. p. 2, 6, 57, 91, 1441, P.M.H. p. 71. Colonies Motives for founding. P.A.H. p. 60. Covetousness see Money. Upham’s M.P. vol. 2. p. 375. Conjunctions Origin of. Upham’s M.P. vol. 2. p. 442. Crops taking up, or bearing. Wes. W. vol.3,p. 211, -54, -88, 364, -65, 583, 590. Masturbation C.C. Gen. 38 note. Address. M.M. vol. II, p. 214. Saved by Man. M.M. 1838, p. 341. 1.st That it will be The Object & Business in my life to save my Soul, & life to the Glory of God. 2.d That as the Time is short, & I have much to do, I will not spend any portion of my time in Unprofitable Conversation. 3.d That I will spend no part of any day, in Desultory Reading, or in Recreation, till I have performed the duties of my Calling. 4.th That I will Sing no Song, but such as will have a tendency to make my heart better. 5.th That on the Lord’s Day, I will avoid all Worldly Conversation, Servile Labor, Journeying, Visiting, Strolling, Non-religious Reading, & Slothfulness. And will perform all Works of Mercy & Necessity. 6.th That I will always repay an injury, or unkindness, by (if possible) some favor; or at least by some kindness. 7.th That All that the Lord hath spoken I will do. Ex. 19, 5-8. 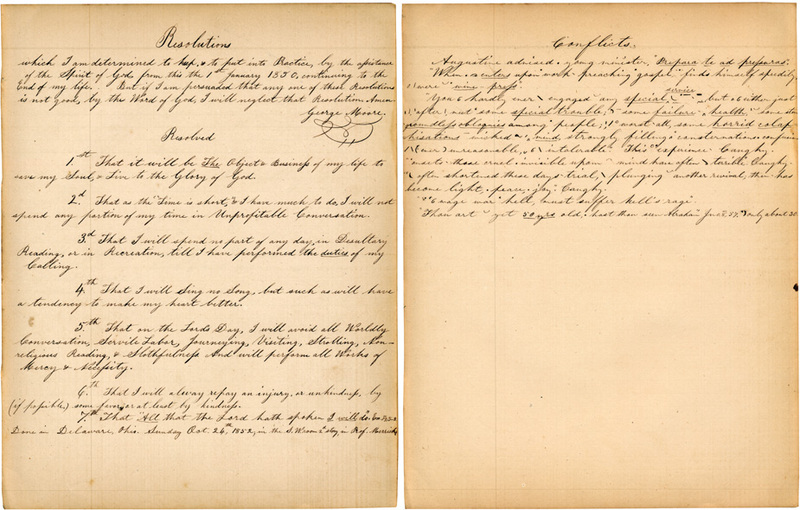 These Resolutions are followed by two pages of what I call prayerful resolutions (dated March 21st, 1855), and then the passage headed Conflicts (above right). Both of the latter sections contain a number of stenographic marks, that might be interpreted by reference to the transcribed passages in Augustine. Thanks to Ken Haverly of Meetinghouse Books for bringing this volume to my attention.